I have come across many different recipes of palak dals in my younger days, but I feel adding spinach at the end brings in more nutritive value and retains the lovely color also. I generally make this with toor dal. A very good way to replenish the protein requirement of the body, this preparation is just the thing one can order. For me I can camouflage the spinach with the dal and make my son eat it without any suspicion. Wash the lentils properly and soak in water for half an hour. Add lentils, water, salt and 1 tsp oil in a pressure cooker. Set on high flame till 1st whistle and then reduce the heat. Cook for another 10-12 minutes or until it is cooked. Remove from heat and allow steam to escape. Cut the spinach leaves roughly, mash the dal slightly with the back of wooden laddle and now add it to the dal and cover. Heat ghee in a frying pan, add whole red chilly, cumin seeds and let them splutter. Add onions, garlic, ginger, tomatoes, pinch of salt and fry until it starts leaving oil. Add remaining palak leaves and add red chilly powder for color just before taking the fried mixture off from the heat. Add this tadka immediately to the cooked dal and put it back on flame for 5 minutes. Serve this delicious, flavoury dal with parotha or roti. Wow, good girl, you are preparing such good food for your active son and sharing with us too - me love palak dal a lot too, but have not tried adding garlic so far, will try out now. Vsiting your blog after a long time, I am caught up in different things. 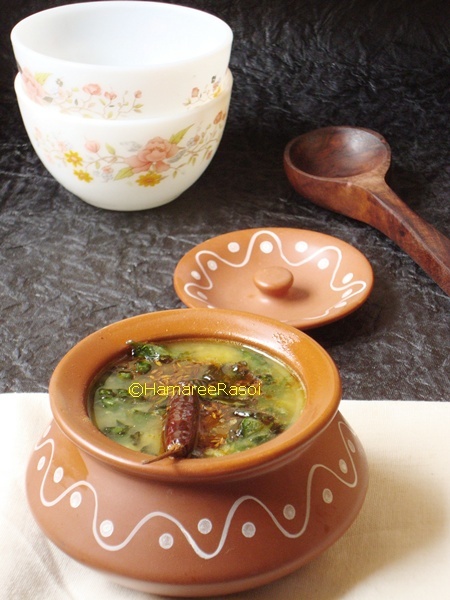 I quite like this dal recipe, I will surely try it when winter sets in and the spinach is really fresh and yummy. This is a very very fav comfort food in our home - we make it often and enjoy it each time - your pictures make me drool! Looks uber yummy! My favorite gravy with rice as well as chapatis. Nice matka. You did the painting Deeps? My kind of comforting food, love garlic flavour in dals too. looks very healthy and nice pics..
That dal looks fantastic deepa. BTW I loved that clay pot? where did you get that from? 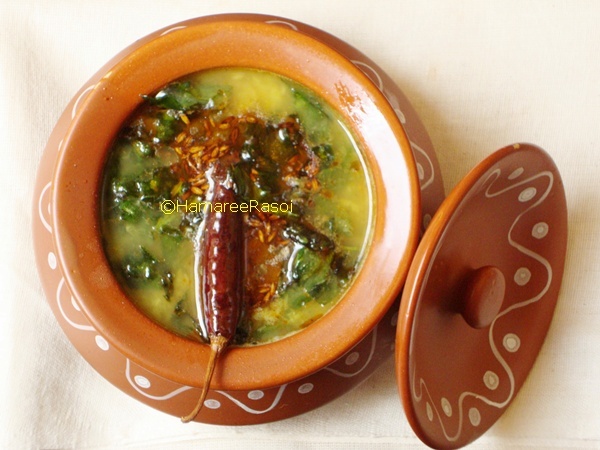 Luv the "Handi" ....... looks so rustic n beautiful :) Palak Daal is such a comfort food ...... luv it. Love the dal and the mutki too. Its my favorite & I love the way you have prepared & put for show. A very healthy recipe...I love adding spinach to dals..Love your cute pot. healthy n yummy ...my all time fav....love the presentation! Love the presentation,healthy comfort food. delicious and innovative recipe... beautiful presentation..
dal palak is absolutely one of my favorites !! !I make it almost the same way...ur presentation is awesome dear !! !loved that clay pot !!!!! blr er eitai subidhe sara bachor methishaak, dhonepata, palong paoya jay. tumi winter er katha mone korie dile ei asadharon dal ta die. palak dal is my hubby's favorite Deepa, you done very well. If you are interested please join me at my first solo event. 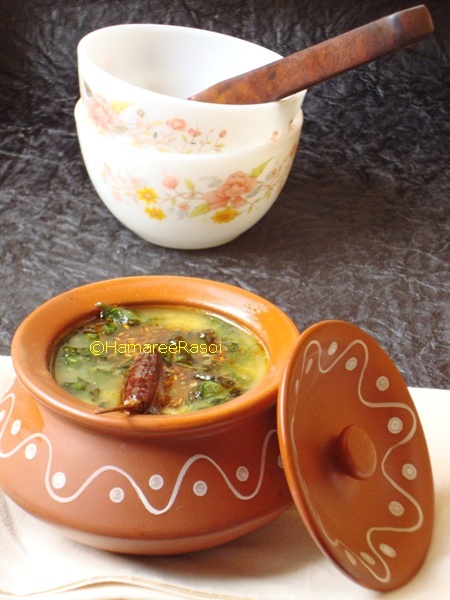 This is my family favourite..we call this keerai koottu.. :) comforting and gentle on tummy! goes with anything too..
was thinking of doing a 'phototips' post and had been thinking whether I am a good photographer..now I feel so confident..after the win! and also all the good words form readers like you! :) thanks again, dear!! tasty daal......lovely pics..like the pot !! Omg!!! Let me burp first dearie...oops excuse me! Hehe..
looks so yummy :) I love the pot too.. 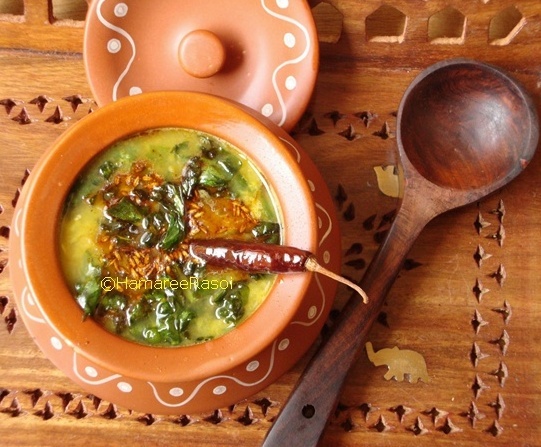 This is my all time favorite dhal...looks more delicious in that cute lil pot.